Marantz PM6005 review | What Hi-Fi? If you’re in the market for your first ever hi-fi stereo amplifier, this Marantz should be your first port of call. Why? Well it’s rather brilliant: costing a budget (in hi-fi terms) £300, this amp comes in a sturdy metal chassis and not only sounds even better than its Award-winning predecessor but now also comes with digital connections. The older PM6004 has been our go-to recommendation for a budget amplifier in recent years. However, its smooth, easy-going performance (which we liked) couldn’t match the subtler and punchier Rotel RA-10 (which we loved) last year. Marantz has come back with all its cards on the table, and the new PM6005 is a straight flush. It’s a more detailed, rhythmic and articulate listen, and the ace up its sleeve is the new built-in DAC. The inclusion of a digital-to-analogue converter shows that Marantz has recognised the changing habits in how people listen to music today: Spotify playlists, ripped CD albums, downloaded tracks, all stored digitally in hard drives, laptops or smart devices. The DAC also supports high-resolution audio files of up to 24-bit/192kHz sampling rates, which means those with higher-than-CD-quality music can play their files through either digital input. We do wish Marantz had gone just one step further, and included a USB input for a more straightforward connection to laptops. Sure, you can use the PM6005’s optical input, but you need an adapter to connect the optical cable to a laptop’s 3.5mm headphone port (which on our Mac laptop doubles as the digital output). USB-to-USB is far simpler, and that extra input would have been a clearer acknowledgement of laptop-based music. There’s no 3.5mm jack to let you connect your smartphone or tablet to the amp – an adapter cable could be used, but it’s not as neat. Compared with the inventive NAD D 3020 (which has Bluetooth streaming), the PM6005 is still only dipping its toe in digital waters. It’s a great start, but we’d love to see Marantz fully embrace all digital sources with its next iteration. 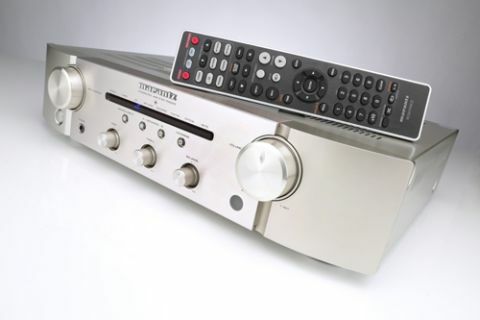 Marantz’s analogue heritage is still strong, though – plug your CD player into any of the four line-level inputs, or a turntable into the moving-magnet phono stage. A tape loop for recording is also included, as is a 6.3mm headphone socket. Whichever source you use, you can be sure that the PM6005 is going to play your music with all the enthusiasm and rhythmic ability it can muster. At its heart is the smooth and easy-going character that we’ve always liked, but the layers around that are more detailed, agile, and precise. It’s a far more articulate sound than we’ve ever heard from a budget Marantz amplifier. Play Radiohead’s 15 Step on vinyl and the PM6005 marshalls the intricate and complex arrangement into a cohesive, rhythmic performance of tight drum beats, melodious guitars and lulling vocals. As the song progresses and brings more instruments into the fold, the amp opens up, revealing a wide and spacious soundfield with superb stereo imaging. The White Stripes (on CD and streamed from Spotify) deliver an attitude-laden, fast-paced performance, with the open top end managing to sound smooth without losing any bite. Basslines are deep and taut, string plucks are tactile. It steers clear of sounding clinical – overall the sound is sparklingly clear and effortlessly musical. Despite its revealing sound, the Marantz doesn’t snub its nose at inferior recordings. It treats all types of music – whether a 24-bit recording of Lorde’s Royals or a 320kbps streamed track – with the same degree of respect and liveliness. Its upbeat sonic character remains consistent across all inputs, although we found the line-level connections sound best. It’s an admirable performance, and the Marantz doesn’t back down from tackling even our demanding reference system: Roksan Caspian M2 CD player (£1800) and ATC SCM 11 speakers (£1200). But pair it with appropriate kit, such as its partnering CD player the Marantz CD6005, and everything clicks into place. The Marantz separates are tuned to play together so perfectly, we can’t tell where one ends and the other starts. The final touch to this excellent budget system could be a pair of Dali Zensor 3 speakers. There are more subtle speakers, but the Zensors’ fun character, zippy rhythms and bold dynamics are addictive to listen to. They suit the Marantzes’ lightfooted, crisp and precise sound brilliantly, and the entire system is hugely entertaining. You’ll need to clear out a sizeable space on your kit rack for the Marantz amp – it’s a chunky slab of beautifully made metal, available in either black or champagne gold finishes. On the plus side, you’ll need only one remote to control both the PM6005 and CD6005. There’s plenty to sing about with this Marantz amp. The digital upgrade broadens its appeal to a wider audience, and gives it an edge over its Rotel rival (which remains staunchly analogue). But it’s that wonderfully lively and detailed sound quality that makes the PM6005 such a fantastic budget stereo amplifier. Go on, let it into your home and play your music – you’ll love it.